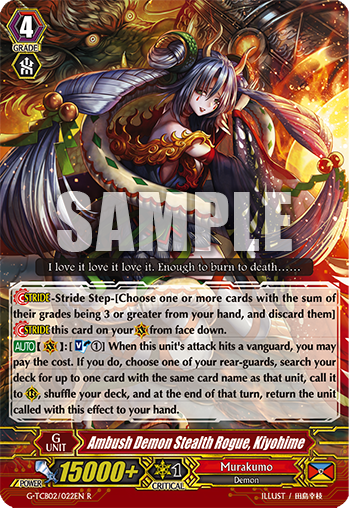 Today’s “Card of the Day” features the new on-hit Stride for Murakumo. [AUTO](VC):[Soul Blast (1)] When this unit’s attack hits a vanguard, you may pay the cost. If you do, choose one of your rear-guards, search your deck for up to one card with the same card name as that unit, call it to (RC), shuffle your deck, and at the end of that turn, return the unit called with this effect to your hand. ← Welcome to our new project!